A familiar story is missing from this month’s issue of Access Press. 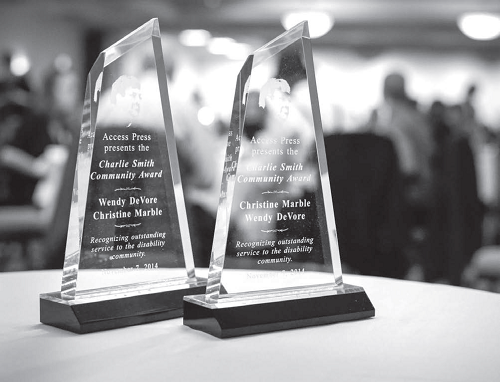 September is when the Access Press Board typically announces the winner of the Charlie Smith Award, given annually to Minnesota individual or group in recognition of outstanding service to the state’s disability community. The winner is honored at a banquet and award presentation. work on its future plans and its long-term financial stability, the Charlie Smith Award nomination process and award event will be postponed until 2019. The newspaper board and staff appreciate the patience of those who have asked about submitting nominations, and those who like to read about the many great people in our community who are nominated. Anderson said that postponing the award until next year gives the newspaper staff and board time to continue to work on financial stability and future planning, while continuing to provide the news and information readers have come to expect. The newspaper continues to welcome donations as well as new advertisers and issue sponsors. The Charlie Smith Award tradition will continue, and new names will be added to the honor roll of previous winners, Benjamin said. The past winners all continue to contribute to Minnesota’s disability community, each in his or her own way.